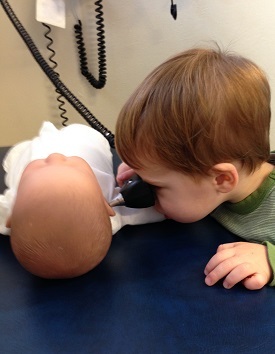 Our policy is to see EVERY sick child the same day when they call during office hours. It is always best to call as early in the day as possible for a sick-visit appointment, however, and this is especially true on weekends & holidays when we are officially closed. It is NOT our policy to give medical advice over the phone. No physician or nurse is ever trained in school how to make a correct diagnosis this way! After hours, our goal with an acute illness on the phone is simply to determine how urgent the situation is and how to best deal with it until it can be seen — NOT to diagnose or treat. Still, there are many illnesses which you should be able to manage at home without a doctor’s help! To guide you in caring for many common childhood symptoms, and in knowing when to call, we have published an Acute Illness Guide which is available here on-line and in paper form free of charge to all families here in our office. We urge all of you to pick one up and keep it handy at home. Providers do not take telephone calls during regular office hours. They can be reached during “call-in hours” when they answer the phone directly or through email in our MyChart portal. If you have a non-urgent question we ask that you try the portal or call-in hour rather than phoning at other times. If they are already speaking with another parent you may be asked to leave a voice mail – if this happens the provider will call back sometime the same day, or you may try calling back yourself in a few minutes at which point they should be free. Use this time to ask medical questions, seek other advice, or discuss any issue you desire. When you call our main number after hours, you will reach a recording telling you who is on-call and explaining how to page them.The provider on-call should return your call within 30 minutes (usually within 10). Most of the time this system works wonderfully, but there is potential for breakdown. Therefore, if you have not heard back within this time frame CALL AGAIN. If for some reason you cannot reach us in an urgent but not emergent situation, we STRONGLY recommend you go to the ER at Children’s Hospital in Boston. By doing so you will ensure that your child is seen by a pediatrician and gets care which is substantially the same as our office would have provided. You will also guarantee that our on-call provider will be informed of what happened in a timely and complete fashion, and that he or she will become involved should hospitalization be necessary.